The West accuses Iran of working on nuclear weapons under the guise of a civilian energy program. (CNN) -- Iran has agreed "in principle" to an offer by Brazil to mediate its stalled nuclear fuel swap, Iranian media reported Wednesday. President Mahmoud Ahmadinejad made the announcement in a phone conversation with his Venezuelan counterpart Hugo Chavez, the semi-official Fars news agency said. 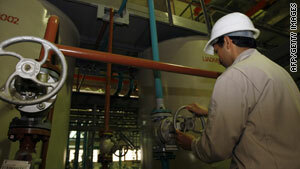 The news agency said Iran and Brazil will now work out the technical details of the offer. The nuclear fuel exchange centers around enriched uranium. Iran says it was enriching uranium from its current 3.5 percent to 20 percent -- the threshold for uranium capable of setting off a nuclear reaction. The country says it needs the enriched uranium to fuel a research reactor, which produces isotopes for cancer patients and which is running out of fuel. The West, however, accuses Iran of trying to create nuclear weapons under the guise of a civilian energy program. The five permanent U.N. Security Council members plus Germany offered Iran a deal last October: send the low-level uranium out of the country to be enriched elsewhere in exchange for fuel for its reactor. Tehran did not accept and instead made a counteroffer: make the swap a simultaneous one and carry it out on Iranian soil. The United States is now seeking support for expanded sanctions, saying Iran is unlikely to negotiate unless sanctions are in place. Brazil -- which shares a table on the U.N. Security Council, where it holds a non-veto seat -- has said it "will not bend" to U.S. pressure to seek sanctions. It has said it will try to help revive the stalled deal to help Iran avoid fresh sanctions.